Techs are enhancements that can be equipped by characters to enhance movement and provide new abilities. To view and equip techs go players must visit the Tech Lab at the Outpost. Aside from the initial tech in each slot, which unlocked after completing a challenge course at the Outpost, players must unlock each tech using eight tech cards before they can equip it. Players may also purchase a Tech Console from the Tech Console Dispenser to the left of the Lab after obtaining the 3 base techs. Exactly one tech from each category can be equipped at any point. Currently equipped techs can be viewed in the inventory window. Head techs allow the player to transform into a variety of small spheres, each with unique abilities. Head techs are activated by pressing F, and players will stay transformed until they press F again. Players cannot regenerate energy while in sphere form, so the cost to transform is only regenerated after leaving sphere form. While in sphere form, players will still take damage from all normal sources. Body tech is initially unlocked by completing Getting The Ball Rolling at the Outpost, which provides access to the Distortion Sphere tech. Each of the upgraded spheres provides the utility of the distortion sphere, alongside additional abilities. Players can only have one head tech selected at a time. Body techs provide the player with a range of alterations to their horizontal movement, most of which are momentary "dashes". They're all activated by double-tapping either right or left. Besides Sprint, all body techs cost no energy and simply have a cooldown between uses. Once the tech's cooldown is complete, the player will briefly light up somewhat, and it can be used again. Only one body tech can be equipped at a time. 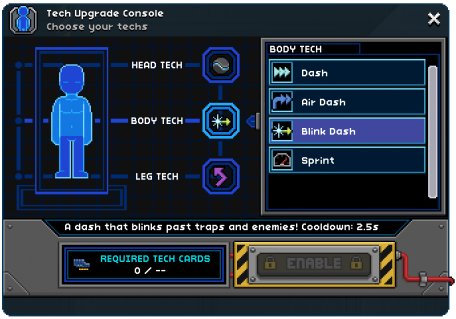 Access to body techs requires completion of A Dashing Individual, which rewards the player with the basic Dash tech. Leg techs provide a range of alterations to how the player's jump behaves, allowing mid-air jumps, wall jumps and directional mid-air boosts. None of these techs have an energy cost, but will only refresh when the player touches down on land again. Only one leg tech can be equipped at a time. Access to leg tech requires completing Jumping To The Right Conclusion, which grants access to the Pulse Jump tech. During early beta testing, specialized techs provided players protection against planetary environmental effects like heat, cold and radiation. These techs were replaced with environmental protection packs (EPPs) which provide the same environmental protection. There are a number of techs which have been replaced, or disabled. They are not available through normal gameplay. Particle Thrust Press and hold Jump plus a direction in the air to float around with this Particle Thrust tech. FTL Boost Double tap Left or Right to use this super fast FTL dash. Only works on the ground. Targeted Blink Press F to teleport to your mouse cursor with this Targeted Blink tech! Requires line of sight to the destination. If a line of sight jump cannot be made, the player will teleport up to the obstruction. Butterfly Boost Press and hold Jump in the air to float around with this Butterfly Boost tech. Human Car Press F to use this. Traverses rough terrain quicker. It can also jump! Human Jeep Press F to use this. Traverses rough terrain quicker. It can also jump! This page was last modified on 11 March 2017, at 05:00.